Comments: From the creator of What's Michael comes this amusing tale of a country girl trying to adapt to life in the big city. 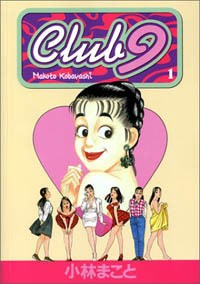 Club 9 is unlike any manga I've ever read. However, its uniqueness doesn't come from a mind-blowing sci-fi storyline, nor is the storytelling method altogether unusual. Rather, Kobayashi Makoto's latest domestically released manga stands out from everything else thanks to its extremely down-to-earth plot. There aren't any explosions, the fate of the Earth isn't in the hands of the main protagonist, and she doesn't possess superhuman powers, either. Haruo Hattori is nothing more than a simple country girl -- albeit one that's quite a bit of fun to observe. As the back of the first volume proclaims, this is a "fish-out-of-water" tale, following the daily life of the aforementioned country bumpkin as she leaves the rural Akita prefecture for college and the big city. Back home, everyone -- especially the town's baseball team, adored her. She was the primary reason they ended up winning the 1992 Summer National High School Baseball Championships, though few people outside of her hometown are aware of that. For the most part, Haruo is a very straightforward girl. She wants nothing more out of life than to make her parents proud and to perform well enough in college to impress her boyfriend back home. Of course, she soon learns that straightforward values don't necessarily align well with the convoluted lifestyle any large city will force upon its inhabitants. Haruo is happy enough to move into the girls' dormitory at her new university, until she discovers that the ghost of a very lonely student haunts it. More annoying than frightening, he eventually bothers her enough that she is forced to move out in order to maintain her studies (along with her sanity). However, it's expensive to live alone in a metropolitan area, so she despairs at first. Luckily, Haruo's extremely charismatic and already has plenty of friends in college. Her small town charm and obvious innocence endears her quickly to people who may otherwise be suspicious of a girl wanting to move in with them. Thanks to her amenable nature, a friend of hers offers to put her up until Haruo can find a place of her own. Yet, Haruo's not the type to take something without paying the lender back in return, so she manages to get a job with her new roommate working at a prestigious club -- the titular Club 9. There's plenty of humor and real-world conflicts in this story as Haruo tries to make it in a far-less-friendly environment than what she grew up with. However, she has an admirable will to carry on and a near-indomitable spirit, so there's a high probability that she'll do just fine...if she can just find her way around town without getting lost. The art style for this book is similar to the visuals in most Miyazaki films. Girls are portrayed as being very curvy, with round faces and almost circular eyes. While much of the manga's focus is on characters and their expressions, the city and countryside detail is impressive. Some things are undeniably exaggerated for humorous effects, but the overall visual style is more realistic than most other manga. It's very pleasing to look at. As usual, Dark Horse has done a wonderful job of getting the translation done without noticeable typographical errors. One thing that obviously sets this work apart from most any other manga is the strong rural accent Haruo speaks with. It's hard to translate accents, and giving her a Southern drawl is as good as any if one is trying to highlight the fact that she's not from the city. Of course, Japanese does have different accents just as English does, and it's nice to see the translators note that in the English version. The book is flipped (as I believe all of Dark Horse's books are...for now) but bound exceptionally well (again, as all of Dark Horse's books are) and well presented with a cute front cover illustration. I'm excited to see more books like this and Happy Mania appear in English, for it represents the publishers' willingness to appeal to more than just a young male audience. Manga fans that only read Dragon Ball may not appreciate this series as much as others, but that's a good thing. Diversity is a sign of the growing presence of manga in English, and as I said, this pleases me greatly. This book was a lot of fun to read -- despite the lack of explosions. I can especially recommend it to the female audience out there. Haruo may be from the country, but she's no dummy, and it's nice to see a strong but sweet feminine heroine. If this series does well enough, perhaps we'll get an even wider variety of manga in the future.